Apparently recorded as Hollindale and Hollingdale, this is an English surname. It would seem to be locational from a place called Hollingdale, except that no place of that spelling has been found in any of the known gazetters of the British Isles. There are over forty places with the prefix Hollin or Holling meaning 'holy', but none that appear to square with the surname. 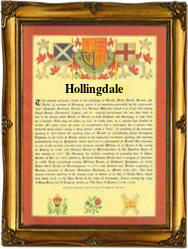 We are therefore left with the conclusion that either this surname is a transposed form of some other placename spelling such as Hollinfare, Hollington or Hollicondane, or it originates from some now 'lost' medieval village, of which the only reminder in the late 20th century is the surname itself. It is estimated that at least three thousand surnames of the British Isles do originate from now 'lost' places, so whilst unusual, this is by no means a unique situation. The surname is well recorded in the surviving registers of the diocese of Greater London, but we have not otherwise been able to establish an epicentre in any other county or town. Locational surnames are usually 'from' names. That is to say names given to people after they left their original home to move somewhere else. This was often London, and hence would explain the preponderance of recordings there. The earliest from this source is probably that of Elizabeth Hollindale who married David Smith at St. Georges in the East, Stepney, on Noveber 14th 1787.